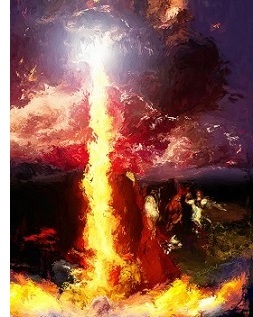 YHWH vs. Baal - One of the great displays of God's power. "So Ahab sent a messenger among all the sons of Israel and brought the prophets (of Baal) together at Mount Carmel. Elijah came near to all the people and said, 'How long will you hesitate between two opinions? If the Lord is God, follow Him; but if Baal, follow him.' But the people did not answer him a word. Then Elijah said to the people, 'I alone am left a prophet of the Lord, but Baal's prophets are 450 men. Now let them give us two oxen; and let them choose one ox for themselves and cut it up, and place it on the wood, but put no fire under it; and I will prepare the other ox and lay it on the wood, and I will not put a fire under it. Then you call on the name of your god, and I will call on the name of the Lord, and the God who answers by fire, He is God.' And all the people said, 'That is a good idea.' So Elijah said to the prophets of Baal, 'Choose one ox for yourselves and prepare it first for you are many, and call on the name of your god, but put no fire under it.' Then they took the ox which was given them and they prepared it and called on the name of Baal from morning until noon saying, 'O Baal, answer us.' But there was no voice and no one answered. And they leaped about the altar which they made. It came about at noon, that Elijah mocked them and said, 'Call out with a loud voice, for he is a god; either he is occupied or gone aside, or is on a journey, or perhaps he is asleep and needs to be awakened.' So they cried with a loud voice and cut themselves according to their custom with swords and lances until the blood gushed out of them. When midday was past, they raved until the time of the offering of the evening sacrifice; but there was no voice, no one answered, and no one paid attention.